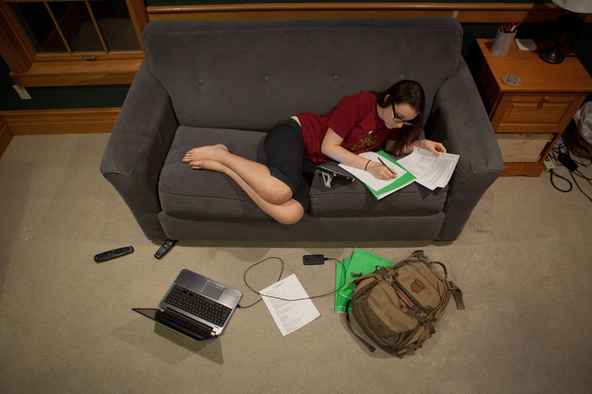 From The New York Times Blog "Motherlode"
Jillian Dos Santos studies at her home in Columbia, Mo. Sleep. Parents crave it, but children and especially teenagers, need it. When educators and policymakers debate the relationship between sleep schedules and school performance and — given the constraints of buses, sports and everything else that seem so much more important — what they should do about it, they miss an intimate biological fact: Sleep is learning, of a very specific kind. Scientists now argue that a primary purpose of sleep is learning consolidation, separating the signal from the noise and flagging what is most valuable. School schedules change slowly, if at all, and the burden of helping teenagers get the sleep they need is squarely on parents. Can we help our children learn to exploit sleep as a learning tool (while getting enough of it)? Absolutely. There is research suggesting that different kinds of sleep can aid different kinds of learning, and by teaching “sleep study skills,” we can let our teenagers enjoy the sense that they’re gaming the system. Sleep isn’t merely rest or downtime; the brain comes out to play when head meets pillow. A full night’s sleep includes a large dose of several distinct brain states, including REM sleep – when the brain flares with activity and dreams – and the netherworld of deep sleep, when it whispers to itself in a language that is barely audible. Each of these states developed to handle one kind of job, so getting sleep isn’t just something you “should do” or need. It’s far more: It’s your best friend when you want to get really good at something you’ve been working on. So you want to remember your Spanish vocabulary (or “How I Met Your Mother” trivia or Red Sox batting averages)? Easy. Hit the hay at your regular time; don’t stay up late checking Instagram. Studies have found that the first half of the night contains the richest dose of so-called deep sleep — the knocked-out-cold variety — and this is when the brain consolidates facts and figures and new words. This is retention territory, and without it (if we stay up too late), we’re foggier the next day on those basic facts. I explained this to my daughter, Flora, who was up until 2 a.m. or later on many school nights, starting in high school. She ignored it, or seemed to. Learning Arabic is what turned her around, I think. She wants to be good at it, and having to learn not only a new vocabulary but also a completely different writing system is, in the beginning, all retention. And you want to rip on the guitar, or on the court, right? Just as the first half of a night’s sleep is rich with deep slumber, the second half is brimming with so-called Stage 2 sleep, the kind that consolidates motor memory, the stuff that aspiring musicians and athletes need. This is not an excuse to sleep through Period 1. Rather, it’s a reason not to roll out of bed too early and miss the body’s chance to refine all those skills learned while kicking a soccer ball off the garage or practicing dance moves. For an older, teenage student, these two learning stages of sleep offer something more: a means of being tactical about sleep, before an important test or performance. If it’s a French test, then turn off the lights at your normal time, and get up early to study. If it’s a music recital, do the opposite: stay up a little later preparing, and sleep in to your normal time in the morning. If you’re going to burn the candle, it’s good to know which end to burn it on. What about math tests? I hate those. Math tests strain both memory (retention) and understanding (comprehension). This is where REM sleep, the dreaming kind, comes in. Studies find that REM is exceptionally good for deciphering hidden patterns, comprehension, and seeing a solution to a hard problem. If the test is mostly a memory challenge (multiplication tables, formulas), then go to sleep at the usual time and get up early for prep. But if it’s hard problems, then it’s REM you want. Stay up a little later and get the full dose of dream-rich sleep, which helps the brain see hidden patterns. If a child can nap without losing a handle on his or her natural sleep rhythm, then let it happen. The upshot is that, for any young student who wants to do better — in school, in sports, in music or even in the social whirl (yes, that’s learning too) — knowing the science of sleep will help them respect slumber for what it is: learning consolidation. Of the best and most natural kind.